UPDATED: Fri., Sept. 7, 2018, 3:06 p.m.
SHASTA-TRINITY NATIONAL FOREST, Calif. – A stretch of a major interstate near the California-Oregon border will remain closed through the weekend as crews try to tame a wildfire roaring along the roadway, forcing truckers and other motorists to take lengthy detours, officials said Friday. The blaze that shut down 45 miles of Interstate 5 in California on Wednesday was still burning out of control in the rural area, said Denise Yergenson, a spokeswoman for the state Department of Transportation. It has destroyed thousands of trees – some 70 feet tall – that could fall onto the roadway, she said. “There is lots of damage, lots of emergency personnel. It’s just not a safe situation,” she said. Officials on Sunday will reevaluate whether to reopen the highway that traverses the entire West Coast from Mexico to Canada and serves as a main artery for commerce. It became a ghost road after fire turned hills on either side into walls of flame. Drivers fled in terror and several big-rigs burned. Drivers for RLT Trucking were slowly making deliveries by taking two-lane mountain roads with bumper-to-bumper traffic that added hours to their trips, company president Al Shufelberger said. About 140 truckers haul cargo for the company based in Redding, south of the blaze. He said only one customer demanded to know why a shipment wasn’t coming on time. “We just sent him articles from our local newspaper about the fire. He said, ‘Sorry, do what you can,’” Shufelberger recalled with a laugh. 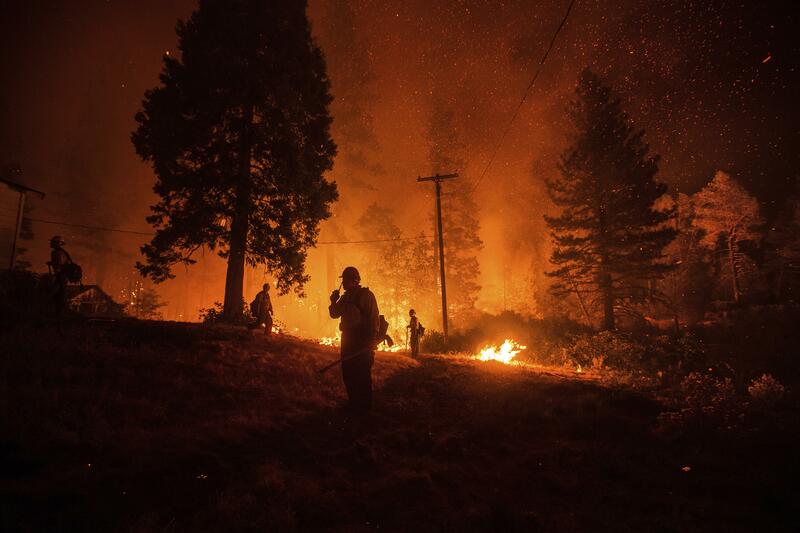 The Delta Fire had burned more than 34 square miles of timber and brush and prompted evacuation orders for scattered homes and buildings in three counties in and around Shasta-Trinity National Forest. At times, flames shot 300 feet into the air. About 280 homes were considered threatened, but the blaze wasn’t burning near any large towns, fire spokesman Brandon Vacarro said. There were some reports that homes had burned, but Vacarro could only confirm that an outbuilding and two mixed-use commercial and residential buildings had been damaged. Patience ran thin at Pilot Travel Center in the town of Weed, near the northern end of the closure, with facilities at the truck stop stretched to the limit and parked big rigs lining nearby roads. The unrelenting flames have drained California’s firefighting budget and prompted victims to file more than 10,000 claims totaling nearly $1 billion in property claims – even before the start of the dangerous fall fire season, officials said. The previous fire near Redding and another in the Mendocino area – the two largest blazes in the state this year – destroyed or damaged 8,800 homes and 329 businesses, Insurance Commissioner David Jones said. The Mendocino fire was expected to be fully contained by Sunday, more than six weeks after it started. The director of the state’s firefighting agency said it only had about $11 million remaining in its annual budget and anticipates needing another $234 million to add firefighters and helicopters, and to cover other costs of fires expected later this year. Published: Sept. 7, 2018, 10:01 a.m. Updated: Sept. 7, 2018, 3:06 p.m.